10% Off All House Plans! Use SPRING19 at Checkout. Flash Sale! 10% Off All House Plans! Use Code SPRING19 at Checkout. FREE shipping on all house plans! From the farmhouse to Colonial, Victorian, and country homes of bygone eras, the porch has been a signature feature of the American home and the center of a family’s social activities. Very popular in the mid-1800s until the advent of air-conditioning in the mid-1900s, the porch was the quintessential “welcome” sign—the window to a family’s interior space. It served as a connection to the outdoors and an integral part of a neighborhood’s “streetscape.” However, over the past few decades, Americans have once again fallen in love with the porch as a welcoming presence to guests and a way to enjoy the best of the outdoors while still at home. 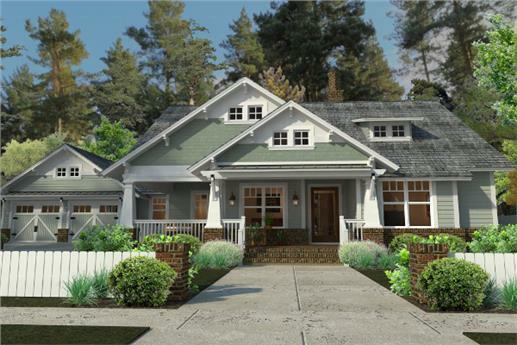 Wind down with a good book and a beverage in the warmth and comfort of the large covered front porch of this Craftsman-style home (Plan # 117-1095). 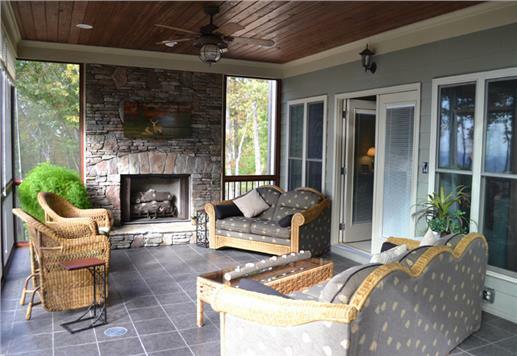 What is the Best Porch for You and Your Home? 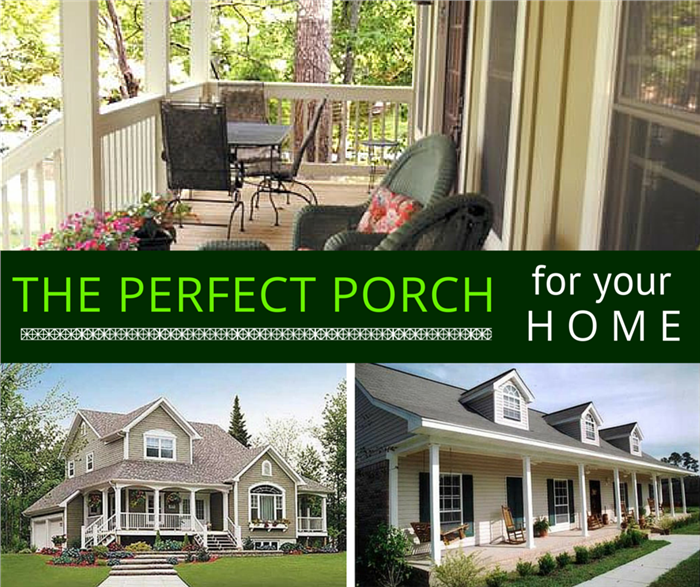 Porches come in all sizes and styles—from the simple and homey to the elaborately furnished; from the wide and narrow to the wraparound, side porch, screened-in rear porch, portico, or large front porch. Your lot size. Is your property wide enough to accommodate a wraparound porch, or would a front or rear porch—or both—be more accommodating? What are your setback requirements from the street or the rear of your lot? The architectural style of your home. A porch can be designed to add curb appeal to almost any home design. Of course, certain porch types and design motifs are a natural fit with specific architectural styles. Dimensions and scale of your home’s main structure. The porch you build should enhance the overall home. To do this effectively, the porch should be appropriately sized to work with the scale of the main house. Materials. Select materials and design elements for your porch that add to the architectural styling of your home. Solid, tapered columns look great on a front porch of a Craftsman home, for example, while thinner, more detailed columns work well on a classic Victorian-style house. We take a closer look at some of America’s favorite porch types—and why these floor plan features might work for you and your home. One of the classic features of farmhouse-, Southern-, Victorian-, and Country-style homes, the wraparound or two-sided porch extends around the home—or at least two sides of it. If you want wonderful views of the outdoors, the sunset, or the moonlight from different parts of the house, this is the porch for you. It is also great for outdoor entertaining. This charming two-story, four-bedroom Southern-style home features one of the classic elements of its architectural design: a spacious wraparound porch that is simply perfect for summer and outdoor entertaining (Plan # 153-1454). 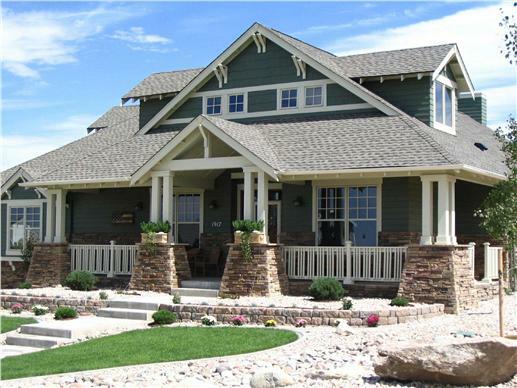 Instead of a wraparound porch, some homeowners may choose to go with a large front porch. This porch spans the width of their home but does not encircle the entire structure. A “welcome” sign for family and guests: the beautiful covered front porch on this two-story Traditional-style home gives it added charm and allure (Plan # 187-1001). Relax and enjoy the view from the large, covered front porch of this one-story country-style home. The wooden rocking chairs add to the warm and rustic atmosphere (Plan # 123-1039). While wraparound and large front porches are attractive to some, others prefer a smaller front porch—one that also showcases the other attractive features of a home, like arched windows and doorways. 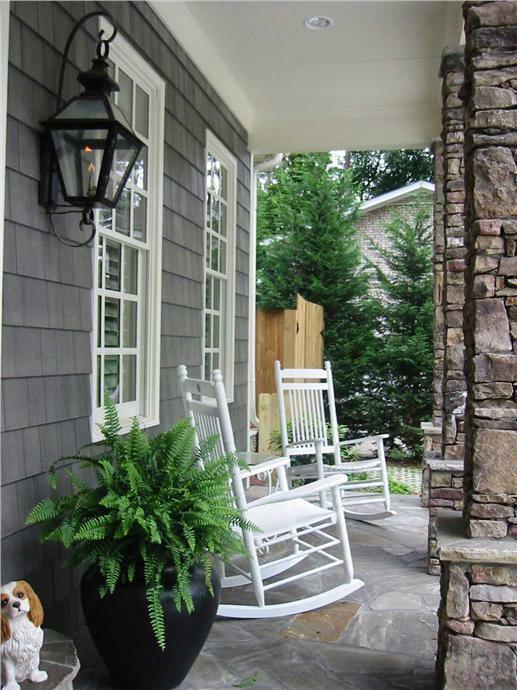 A small front porch can be as appealing and charming as its bigger counterparts. 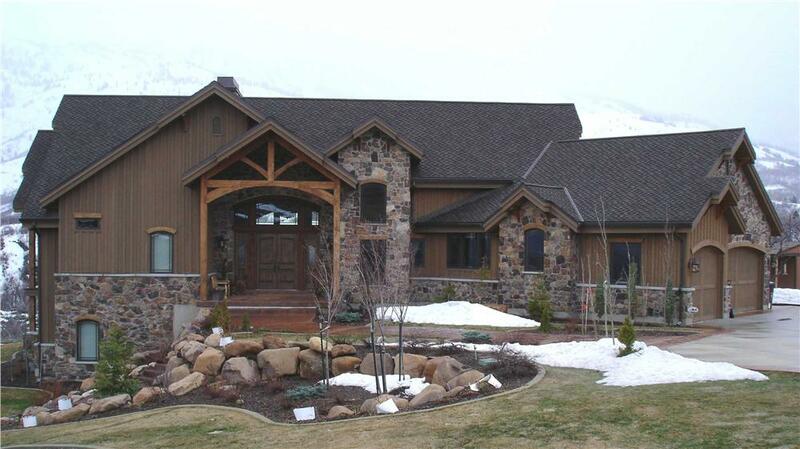 Spend a quiet evening on the front porch of this lovely one-story country home as you wait for guests to arrive for a weekend getaway in the mountains (Plan # 138-1003). Another lovely porch features side and front stairs. 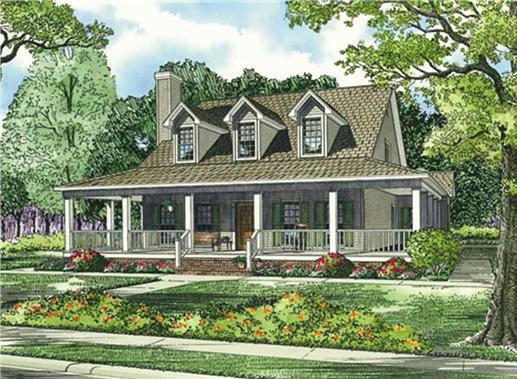 This delightful two-story, three-bedroom country home also sports a side porch, peeking out on the right (Plan # 126-1297). Want to add another sophisticated touch to your home? What about a portico? Described as a small covered walkway or porch with a roof and supported by columns or piers, the portico goes a long way in enhancing a home’s curb appeal. Certainly more economical than renovating the entire front elevation of the home, the portico comes in various styles—from the classic to the modern—and can be installed from a “do-it-yourself” kit or with some help from a designer/builder. 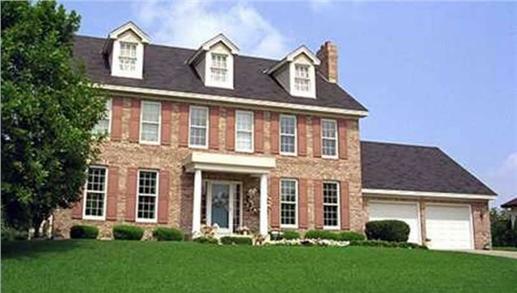 This two-story, four-bedroom Georgian-style home sports a classic portico—anchored by a square roof and twin white columns (Plan # 146-2292). 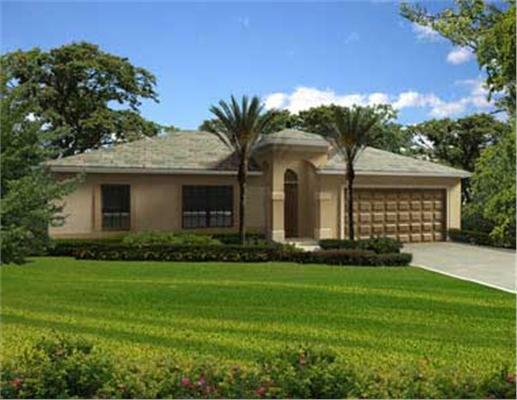 An almost tower-like portico (left) is the exterior highlight of this attractive one-story, three-bedroom Florida-style home (Plan # 107-1044). Talk about “streetscape” atmosphere. This charming three-bedroom ranch-style home features an arched portico lined with plants (Plan # 120-1831). In the 1950s, as Americans longed for more quiet time in the privacy of their homes, architects erased the front porch from many of their designs and started constructing patios and screened-in porches in the backyard. Today, the rear screened-in porch is almost as popular as the front porch. Not only is it a spot to unwind and get some respite from the sights and sounds of family life, the rear screened-in porch is an extension of the home’s entertaining space. Want a spot to relax and spend some “alone time” or meditate on the wonders of nature? 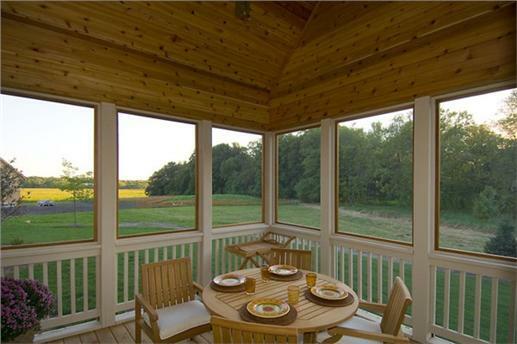 This rear screened-in porch of a two-story, four-bedroom Craftsman-style home provides wonderful vistas of the natural landscape (Plan # 109-1191). Another Craftsman-style home with homier decor on its rear porch, the stone fireplace, wicker chairs, love seat, and couch complete its furnishings (Plan # 163-1055). The porch has been a part of the architectural landscape for centuries, particularly in countries and regions with warm weather. Think about Ancient Greece, Egypt, and Rome, and the early covered courtyards surrounding a home’s private garden. The American porch that emerged during Colonial times borrowed greatly from the classic and formal styles in Europe. The porch in George Washington’s Mount Vernon mansion is a notable example. Other porches were patterned after the wide, sweeping ones common to the tropical islands. And as other immigrants settled in the country, they brought their innovations from their native lands. Before long, balconies and second-floor verandas became part of the architectural designs of homes from coast to coast. 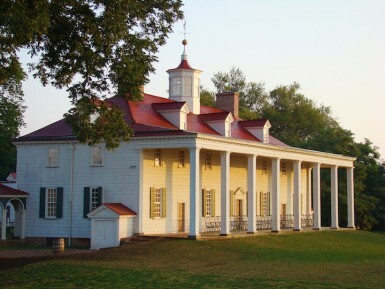 Designed by George Washington himself, the two-story-tall porch at the Mansion in Mount Vernon, which faces the Potomac River, is President Washington’s contribution to American Colonial architcture. 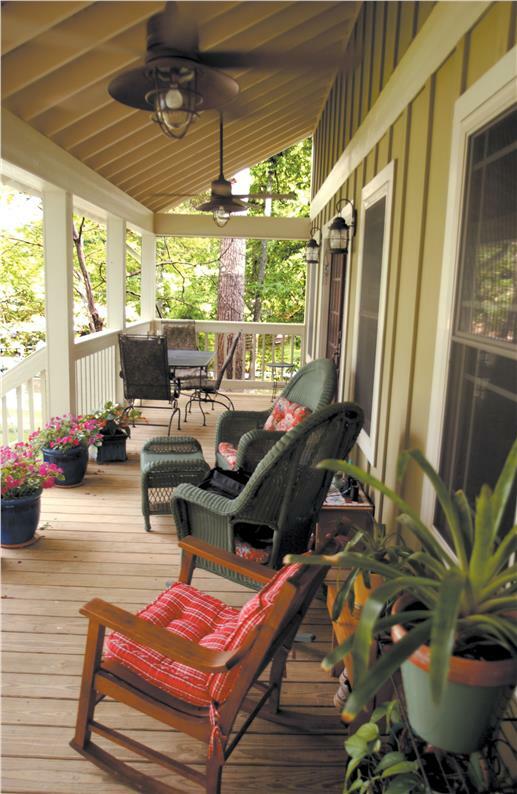 During the peak of its popularity, the porch was the spot to enjoy cool breezes and escape from the summer heat, especially in the Southern states and temperate climate regions. On the porch, families swapped stories with neighbors, watched the kids, waved hello to passersby, or just sat back, relaxed, and basked in the friendly atmosphere. It was a peaceful and calm haven for the family. When the age of technology burst into the American scene—with the automobile, air-conditioning, and television—the porch lost its appeal. There were now better things to do than “hanging out” on the porch with the neighbors—like taking spins around in their new “motorcars.” In addition, more and more families retreated inside the home to listen to the radio, watch television, and focus on private leisure time in an air-conditioned living room. Soon after, the sweeping front porch became a smaller, more secluded side porch; then a back patio—until it virually disappeared from modern home designs. For a time, the porch was a forgotten treasure. But like most precious things, the porch resurfaced. Today, as more Americans dream of the simple and nostalgic old days, the porch has found its way back into the heart of modern and restored homes. 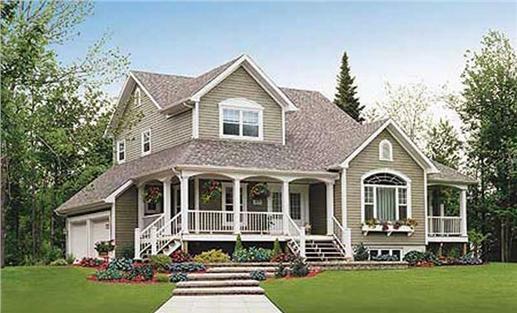 An inviting side-wrapped porch adds to the curb appeal of this delightfully classic two-story Craftsman-style home with four bedrooms and three-and-a-half bathrooms (Plan # 161-1001). It’s your home—and it’s your porch! And you want it to be as attractive, appealing, and welcoming as possible. Let’s start with decor and fixtures. The standard furniture includes wicker or rattan chairs with cushions in bright colors or warm earth tones, rocking chairs, and a table (for refreshments or card games). You can add ceiling fans and light fixtures on doors and windows. Flowers and plants are always a nice touch. But the best part of having a big, wide front porch is the luxury of all that space for the traditional porch swing and hammock—great spots for naps or escaping with a good book. 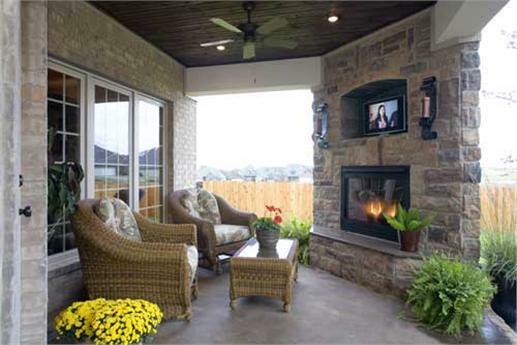 These days, you can have a fireplace and even televisions on the covered back porch. The colorful rocking chair, wicker chairs, table, potted flowers and plants that adorn this large front porch (left) enhance the warm earth tones of the exterior walls. Take a look at the exposed rafters, ceiling fans, and light sconces on each side of the door (Plan 153-1871). Just as appealing is this front porch of a two-story, four-bedroom country home (right), with its twin white rocking chairs, a wrought iron table with a glass top, and a ceramic dog atop the doorstep. A huge potted plant adds a nice touch (Plan # 163-1006). Stay warm and watch your favorite TV program from the cozy outdoor living porch of this two-story, four-bedroom European-style home. The Great Room opens out to the covered porch (Plan # 153-1750). Before you decide to build or renovate, consider the home’s architectural design. This will ultimately dictate whether a wraparound, large, or small porch—or a portico—is the best structure for you. 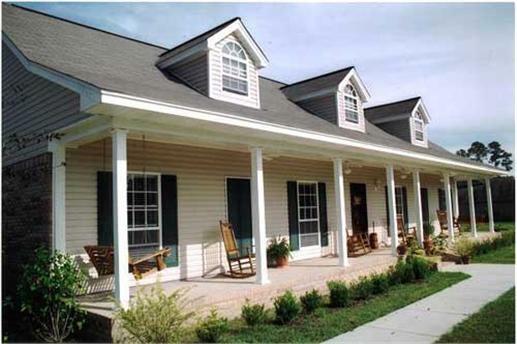 A portico may match your Colonial or Georgian home plan better than a large porch. And a wraparound porch just makes a country home or a farmhouse more appealing. So if you’re ready to jump on the porch revival, be sure that your porch captures that old charm and magic of bygone eras! Footnote: The lead image (upper) in this article is from a two-story, three-bedroom farmhouse-style home. For more details, view (Plan # 153-1871). Fireplace Trends: Are Fireplaces in Houses Still Popular? What is included in a set of house plans? European and Luxury House Plans, Large and Small! Sign up below for news, tips and offers. We will never share your email address. To receive your discount, enter the code "NOW50" in the offer code box on the checkout page.